I was sent this book for free from the author. This book was sent to me direct from the author after contact through Goodreads. Bridges DelPonte sent me a copy of this book in exchange for an honest review. Synopsis: Aquan, a fearless triton, uses her unique power to transform into real and mythical sea creatures to police the boundaries of land and sea from rebel forces. When her fellow tritons are savagely massacred on the eve of her first mating season, Aquan reluctantly teams up with key west dive boat captain, Dave Cutter and marine biologist Jen Ortiz, in a worldwide hunt across the lost sister cities of Atlantis. 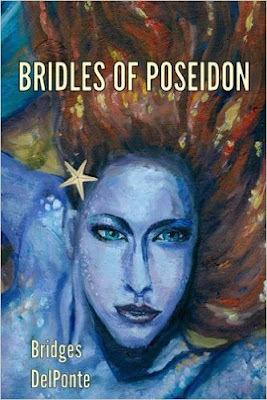 In Bridles Of Poseidon, Aquan must not only unlock her true power, but confront disturbing revelations about the deaths of her parents and dangerous political intrigue in her once peaceful society at Rapture's End. Ultimately, this young triton faces a terrible choice between preventing another great deluge or destroying the future survival of her own underwater community now torn apart by discord and treachery. Review: I would like to thank Bridges DelPonte for sending me a copy of this book. After learning about this book I was excited to read it. I started to read this book but unfortunately I struggled to get into this book. I plan to reread this book in the future to see if my thoughts towards the book change and if they do I will post an update to the end of the post. Even though I struggled to enjoy this book I know that other readers have loved this book so if it sounds interesting to you then just go ahead and give it a go because your opinion may be the complete opposite of mine. I would recommend this book to avid readers of the fantasy fiction genre as it will have a different effect on each reader and some will enjoy it more than others. I am a firm believer in giving something a try no matter what the other reviews are saying as a negative review may be the exact opposite of what you would think. So basically if you think this sounds like a good book don't just base your feelings on the negative but try it as you may be one with positive thoughts about the book.